May 7th in Wordpress Plugins by Wordpress Jedi . In the past few months, we have covered plenty of plugins that let you clean your WordPress database of unnecessary data. WP Cron Cleaner for WordPress is another useful tool that displays all cron job names and frequency of each task. It lets you choose what tasks to clean next. 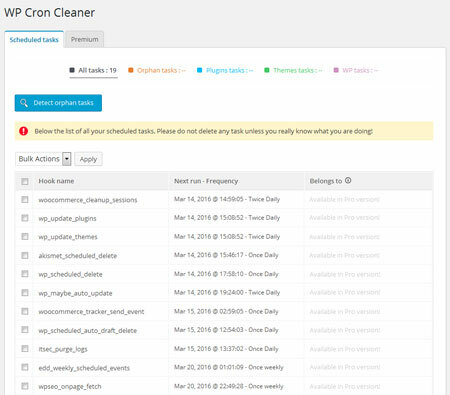 WP Cron Cleaner simply displays all tasks, so you can choose the ones that need to be cleaned. It works for multisite portals. You will be able to see task frequency and parent in the back-end and take bulk action. The pro version detects plugin, theme, orphan, and other cron jobs.